Ever wonder what it’s like to attend a feast at Winterfell? Wish you could split a lemon cake with Sansa Stark, scarf down a pork pie with the Night’s Watch, or indulge in honeyfingers with Daenerys Targaryen? George R. R. Martin’s bestselling saga A Song of Ice and Fire and the runaway hit HBO series Game of Thrones are renowned for bringing Westeros’s sights and sounds to vivid life. But one important ingredient has always been missing: the mouthwatering dishes that form the backdrop of this extraordinary world. Now, fresh out of the series that redefined fantasy, comes the cookbook that may just redefine dinner . . . and lunch, and breakfast. A passion project from superfans and amateur chefs Chelsea Monroe-Cassel and Sariann Lehrer—and endorsed by George R. R. Martin himself—A Feast of Ice and Fire lovingly replicates a stunning range of cuisines from across the Seven Kingdoms and beyond. From the sumptuous delicacies enjoyed in the halls of power at King’s Landing, to the warm and smoky comfort foods of the frozen North, to the rich, exotic fare of the mysterious lands east of Westeros, there’s a flavor for every palate, and a treat for every chef. These easy-to-follow recipes have been refined for modern cooking techniques, but adventurous eaters can also attempt the authentic medieval meals that inspired them. The authors have also suggested substitutions for some of the more fantastical ingredients, so you won’t have to stock your kitchen with camel, live doves, or dragon eggs to create meals fit for a king (or a khaleesi). 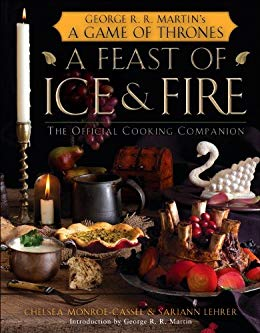 In all, A Feast of Ice and Fire contains more than 100 recipes, divided by region: • The Wall: Rack of Lamb and Herbs; Pork Pie; Mutton in Onion-Ale Broth; Mulled Wine; Pease Porridge • The North: Beef and Bacon Pie; Honeyed Chicken; Aurochs with Roasted Leeks; Baked Apples • The South: Cream Swans; Trout Wrapped in Bacon; Stewed Rabbit; Sister’s Stew; Blueberry Tarts • King’s Landing: Lemon Cakes; Quails Drowned in Butter; Almond Crusted Trout; Bowls of Brown; Iced Milk with Honey • Dorne: Stuffed Grape Leaves; Duck with Lemons; Chickpea Paste • Across the Narrow Sea: Biscuits and Bacon; Tyroshi Honeyfingers; Wintercakes; Honey-Spiced Locusts There’s even a guide to dining and entertaining in the style of the Seven Kingdoms. Exhaustively researched and reverently detailed, accompanied by passages from all five books in the series and full-color photographs guaranteed to whet your appetite, this is the companion to the blockbuster phenomenon that millions of stomachs have been growling for. And remember, winter is coming—so don’t be afraid to put on a few pounds. Includes a Foreword by George R. R. MartinFrom the Hardcover edition.